Now and then we get a call from a customer who is having multiple issues with their chimney. Often it is a combination of a liner falling apart, staining on the outside, and chunks of stucco falling off. 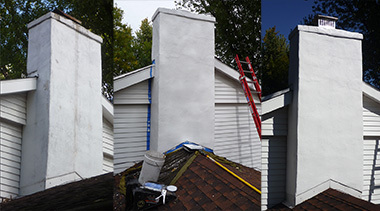 In this case what we do is reline the chimney to control the gases, remove the loose masonry, repair the masonry, and finally apply a coat of elastometric masonry paint to the chimney to spruce it up. Some customers opt for cleaning of the stains if there isn't stucco & paint on the chimney and a water proofing. This is another option and when we come to inspect your chimney and flue we will provide the best option for your home. 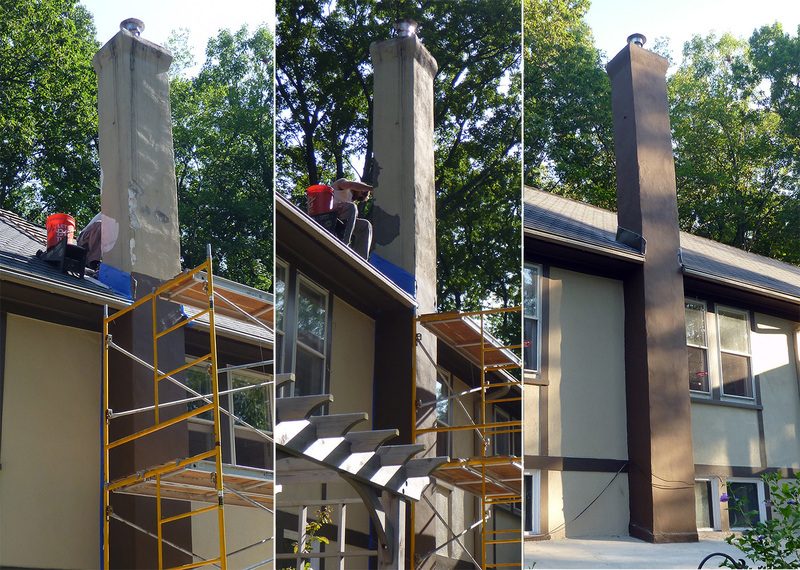 The tan/brown chimney to the right had a stainless steel liner that was installed incorrectly and was torn. This in combination with never having the system cleaned and a poor top-plate allowed moisture/acidic chemicals to collect on the outside of the stainless liner and it rotted the stainless steel liner the entire length. We removed it, installed a new liner, repaired the stucco, and finally applied two coats of paint to match the siding. 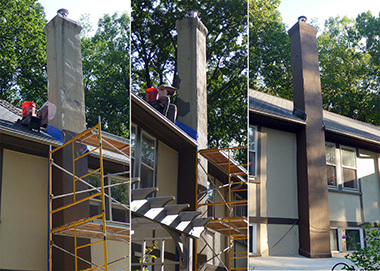 It came out great totally transforming the chimney and the customer was thrilled that it no longer looked terrible and that it was also now safe. The white chimney had flaking paint from years ago, staining, the crown was falling apart, and the cap was a pile of rust. We removed the loose paint and masonry, fixed the masonry, repainted, and added a stainless steel cap so further staining would be avoided. If you are interested in refreshing your chimney rather than tearing it down and building an entirely new chimney please get in touch via our contact page. We would be happy to help you and discuss options.